Q?What is our cancellation and reservation policy? Should you need to reschedule or cancel your appointment, we kindly ask for 24 hours notice. All cancellations for appointments require 24 hours notice for acupuncture and health care appointments. Appointments cancelled with less the 24 hours notice or missed appointments will be charged a $40 fee. We require a valid credit card to reserve any appointments and if there is no credit card used to reserve appointments, payment is required prior to your future visit. Payment in advance may be required for those with a history of no shows or cancelled appointments without 24 hours notice. Q?Is acupuncture covered by insurance? Q?What should I know/expect when coming to my first Acupuncture treatment? Please eat a light meal before coming to your treatment. The first visit the practitioner will spend up to an hour and a half with you. The initial visit consists of an intake of your past and current health history. Follow up visits will be shorter (around 30 to 45 minutes). During your first visit, it is my job to make you as comfortable as possible. Please ask any questions that may concern you. I will be happy to answer them! The acupuncture needles are usually retained for approzimately 20 to 25 minutes. If you are able, please wear loose and comfortable clothing. No!!! An acupuncture needle can actually fit inside a medical hypodermic needle. Overall, the process is painless. You may feel a small poke or prick at the insertion of the needles, however if that sensation is felt, it should quickly disappear. Most patients feel that the treatment is relaxing and often fall asleep. Q?What kind of training does a Licensed Acupuncturist/Herbalist have? The credentials and training can vary from state to state. 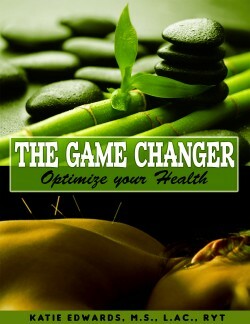 Katie is a licensed and board certified acupuncturist in South Carolina and New York. She graduated with honors and received Masters of Science in Acupuncture and Oriental Medicine. This training involved 3 year round intensive medical training in traditional chinese medicine(TCM), western biomedicine, and herbal medicine. She completed over 3,000 hours of training along with internships in various health centers. After the completion of schooling, she passed the National Board examinations provided by the National Certification Commission for Acupuncture and Oriental Medicine (NCCAOM). Katie also was trained in herbal medicine at Finger Lakes School of Acupuncture and Oriental Medicine. People with this training often receive their degree as M.S.A.O.M. (Masters of Science in Acupuncture and Oriental Medicine) and have a status as a Diplomat of Oriental Medicine (Dipl.OM.). Q?How many acupuncture treatments before I start to feel better? The results of acupuncture vary among individuals. Acute conditions are usually more easily resolved than chronic diseases. As a general rule, patients should experience a significant improvement in symptoms within 6 to 10 treatments. Patient with chronic conditions may need 2 to 3 months of treatment to resolve their condition. Usually patients come about once or twice a week and gradually space out treatments as they start to feel better. The treatment assessment is based depending upon the condition, age, and lifestyle of an individual.